A YEAR OF JUBILEE REVIEWS: BettaSnax Biscotti all natural snacking #giveaway! BettaSnax Biscotti all natural snacking #giveaway! The Snack that Fills the Gap! BettaSnax is a family owned and operated business in the USA! Desiring to find healthy snacks to help in those between meals times, Carol Bard was unable to find tasty and nutritious treats for her children. Treats free of artificial ingredients and convenient to take on the go. So Carol started digging up old family recipes and baking, and BettaSnax was born! These biscotti treats are made with all natural ingredients, and no added fat. That is all, and they are so addictive!! A great flavor, just a small bit of sweetness to go along with the almond taste. They are super crunchy and meet the need for a good crunch. Much healthier than crunching on potato chips! There are no artificial preservatives or flavors which is a huge plus!! 10 calories per biscotti, kept me digging in! We polished off a bag real quick, and all of my kids loved them as well! This is the perfect treat to have around if you want to have a friend over for coffee, goes beautifully with that. Great on the go snack as you run out the door for a sporting event. The almonds are huge and very flavorful!! All that great protein from the nuts, in a simple, healthy, tasty snack. Check your gourmet and natural food stores to see if they carry them locally. If not, give them a sample and they soon will!! I learned that the company donates money for kids' cancer research. They are partnering with Cookies for Kids Cancer to help raise money. They have no cholesterol and no added fat, preservatives, or artificial flavourants. I learned that all products are free of preservatives, artificial colours, artificial sweeteners, and added fats. I learned that it has no cholesterol and no added fat. I learned that they help raise money for pediatric cancer research! What a great company this is! I learned that their website is uninformative in regards to wanting to know if these can be purchased in my vicinity. Looks like a tasty treat though! 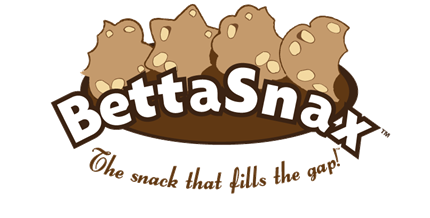 Bettasmax is a family owned and operated business that bakes high quality gourmet snacks. They have partnered with Cookies for Kids Cancer to help raise funds for pediatric cancer research. they are made from all natural ingredients! these delicious snacks are cholesterol free! These are delicious. You have to try them. They partner with Cookies for Kids cancer and help help schools raise funds to be donated for pediatric cancer. I learned that all of their products are free of preservatives, artificial colours, artificial sweeteners, and added fats. Also it is nice that they partnered with Cookies for Kids Cancer to help raise funds for pediatric cancer research. They're raising money for pediatric cancer research! Awesome! I learned that these homemade snacks are made without preservatives, artificial colors and fats, and that they started because of frustrations like my own. It is hard to find healthy snacks so you often have to make your own. Thanks for the chance. I learned Bettasnax was established in 2010. They are free of preservatives, artificial colors, artificial sweeteners and added fats. I learned that they are awesome for raising money for cancer research! !